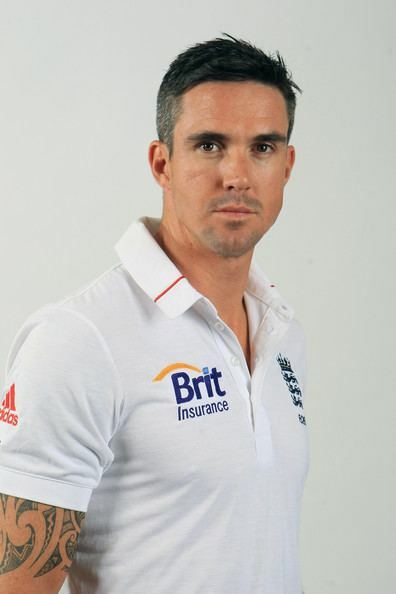 Kevin Peter Pietersen, MBE (born 27 June 1980) is a South African-born English cricketer. He is a right-handed batsman and occasional off spin bowler who formerly played for England and currently plays for Surrey as well as Twenty20 in the Indian Premier League for Sunrisers Hyderabad , in the Caribbean Premier League for St Lucia Zouks and in the Big Bash League for Melbourne Stars. Pietersen was born in Pietermaritzburg, Natal Province, South Africa. He made his first-class debut for Natal in 1997 before moving to England, after voicing his displeasure at the racial quota system in place in South Africa. His English mother made him eligible to play for England and after serving a qualifying period of four years playing at county level, he was called up almost immediately into the national side. He made his international debut in the One Day International match against Zimbabwe in 2004 and his Test match debut in the 2005 Ashes series against Australia the following year. The England teams subsequent reliance on Pietersen resulted in only a single first-class appearance for Hampshire between 2005 and 2010. On 17 June 2010, Pietersen announced his wish to leave Hampshire and he subsequently joined Surrey on loan for the remainder of the season before joining the club permanently from the 2011 season onwards. He was captain of the England Test and ODI teams from 4 August 2008 to 7 January 2009 but resigned after just three Tests and nine ODIs, following a dispute with England coach Peter Moores, who was sacked the same day. His relationship with the ECB never fully recovered. This came to a head in 2012 when, after a disagreement over his schedule, Pietersen announced his retirement from all forms of international limited-overs cricket on 31 May. Although he later retracted his retirement, his relationship with both the ECB and his team-mates soured during the series against South Africa and he was dropped for the final Test of that series. Pietersen became the fastest batsman to reach both 1,000 and 2,000 runs in One Day International cricket He has the second-highest run total from his first 25 Tests, behind only the Australian Sir Donald Bradman, and was the fastest player, in terms of days, to reach 4,000, 5,000 and 7,000 Test runs. He became only the third English batsman to top the ICC One Day International rankings, doing so in March 2007. In July 2008, after a century against South Africa, called him "the most complete batsman in cricket" and in 2012 called him "Englands greatest modern batsman". Pietersen last played for England in the 2013-14 Ashes and subsequent ODIs, after which he was informed that he was no longer being considered for international selection. In the 2014 Indian Premier League, he was signed by the Delhi Daredevils IPL team for 1.5 million USD, and he captained the team for this season. Kevin Pietersen was also signed by the Melbourne Stars in 2014–15 Big Bash League season, with a contract for 2 years as the no.3 batsmen. He has been called the greatest signing in the 2014–15 Big Bash League season by Ten Network. On 18 December 2014, Kevin Pietersen played his first match in 2014–15 Big Bash League season as the no.3 batsmen. He made 66 runs off 41 balls and he also took a catch at point to dismiss Head off Hastings. In the 2015 Indian Premier League auction, Kevin Pietersen was bought by Sunrisers Hyderabad for 2 Crore Rupees. Pietersen was born to an English mother, Penny, and an Afrikaner father, Jannie. Pietersen had a strict and well-disciplined childhood, along with his three brothers Tony, Greg and Bryan; he learned valuable lessons from this "fantastic" approach to parenting, and said: "Discipline is good. It taught me that I didnt always have to have what I wanted; that what I needed was different from what I wanted." Bryan plays club and second XI cricket in England. Pietersen attended Maritzburg College, Pietermaritzburg, and made his first-class cricket debut for Natals B team in 1997, aged 17, where he was regarded predominantly as an off spin bowler and a hard-hitting lower-order batsman. After two seasons, he moved to England for a five-month spell as the overseas player for club side Cannock CC, helping them win the Birmingham and District Premier League in 2000. This first spell away from home did not leave him with fond memories for England, in particular "those horrible Black Country accents" referring to the dialect of the West Midlands, living in a single room above a squash court, and working in the club bar. However, he returned to newly renamed KwaZulu Natal side a better cricketer; a lack of opportunities to bowl had improved his batting. Having seen Pietersen play at a school cricket festival, Clive Rice invited him to sign for Nottinghamshire County Cricket Club. Pietersen accepted without hesitation, keen to make the most of top-class cricket under a coach for whom he had the utmost admiration. He did not at this stage contemplate forsaking his nation; nor had it yet occurred to him that the decision would eventually have to be taken. Pietersen is widely portrayed in the media as having a self-assured personality, described by Geoffrey Boycott as being "cocky and confident". Former England test captain Michael Vaughan counters this, saying, "KP is not a confident person. He obviously has great belief in his ability but thats not quite the same thing... And I know KP wants to be loved. I try to text him and talk to him as often as I can because I know he is insecure." He has been noted for unusual haircuts, with his peroxide blond dyed streak of hair along the middle of his head during the 2005 Ashes series being described as a "dead skunk" look. During the 2006–07 Ashes tour, the Australian team, noted for their efforts to dominate opponents psychologically, dubbed him "The Ego", or "FIGJAM" (F*** Im Good, Just Ask Me). Other nicknames include "KP", "Kelves" and "Kapes". Pietersen returned from injury in time to play a part in the 2009–10 winter tour of South Africa. His contributions, nevertheless, were significantly below his pre-injury range with an average innings of just 27. He showed several lapses of concentration, leading some to suggest that off-field distractions and lingering issues with his removal from the captaincy were still affecting his form. Former England batsman and commentator Geoffrey Boycott detected a new technical fault of playing across full-length deliveries. Pietersen went into the two-match tour of Bangladesh on the back of poor performances on his return from injury and led to speculation Pietersens England place was under pressure. However, an important first innings of 99 in the first Test and a series clinching score of 74 not out in the second, during a stand of 167 not out with Alastair Cook, saw Pietersen return to much more respectable figures. England won the series 2–0 and Pietersen finished with total runs of 250 and an average for the series of 83.33. Pietersen was part of Englands 15-man squad for the 2011 World Cup hosted by Bangladesh, India and Sri Lanka between February and March. In the warm-up matches he was asked to open the batting in anticipation that he would assume the position for the whole tournament. He had opened the batting just six times in one-day games and never for England, although had done so for England A in 2004. Pietersen returned home early due to injury. A hernia required immediate surgery and the recovery time of around six weeks meant he would miss the rest of the tournament and potentially the IPL. Eoin Morgan took Pietersens place in the squad. Pietersen earned some criticism after being sighted at a nightclub in London while injured, however he dismissed the criticism as unwarranted. He returned from injury for the home series against Sri Lanka in May 2011. Pietersen was also picked to play against India in July 2011, and scored 202 not out at Lords in the 1st Test. During the innings, Pietersen passed 6,000 runs in Tests. The feat took exactly six years, which is the fastest in terms of time taken, and 128 innings. In the fourth Test he scored 175 runs and shared a partnership of 350 runs with Ian Bell. Pietersen was rested for the ODI series against that followed the Tests. Pietersen featured in the three-Test series in New Zealand in February 2013, scoring 73 in the second match. A knee injury forced him to miss the return home series in May that year, however, and prompted fears over fitness for the upcoming 2013 Ashes series. Though he did not play against New Zealand, the ECB remained hopeful over his ability to play against Australia come the summer. On 3 August 2013, Pietersen not only scored a century in the third Ashes series match in the first innings, he became the highest run scorer for England across all forms of cricket combined. His return Ashes tour over the winter of 2013–14 was less successful, however. In a series which England lost 5–0, Pietersen averaged only 29 and passed fifty only twice in ten innings. He remained nevertheless Englands leading run scorer with 294 runs. He also bowled during the fifth and final Test. Once the tour had ended, and the fallout had contributed to the removal of Flower as head coach, there was much media speculation on the nature of Pietersens relationship with the team management. The ECB met and announced on 4 February that Pietersen had not been selected for the upcoming tour of the Caribbean, a decision they described as "unanimous". Media announcements immediately began stating that Pietersens career was over. Pietersen himself released a statement which read "Although I am obviously very sad the incredible journey has come to an end, Im also hugely proud of what we, as a team, have achieved over the past nine years." In February 2014, Delhi Daredevils of Indian Premier League bought him for USD 1.5 Million.